The USB2004EXT2 4-Port USB over Cat5 Extender lets you extend USB 2.0 connections over distances up to 100-meters (330-feet) over standard Cat5 or Cat6 UTP cabling. Backward compatible with USB 1.x devices, the extender allows up to 4 of almost any kind of USB device to be placed at remote locations away from the host computer system. 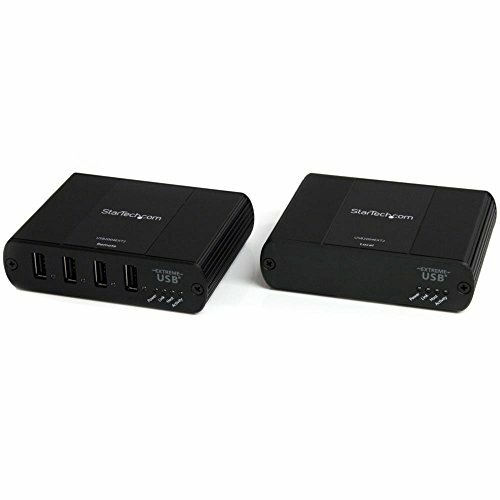 With data transfer rates up to 480 Mbps and 500 mA of power per port (with the use of an external power adapter at the remote end), the USB extender makes for a fast, easy-to-setup and versatile USB extension solution, with a sleek metal enclosure that ensures durability in all types of operating environments. Backed by a Startech.com 1-year warranty and free lifetime technical support.